Midwest Products Chesapeake Bay Flattie kit. 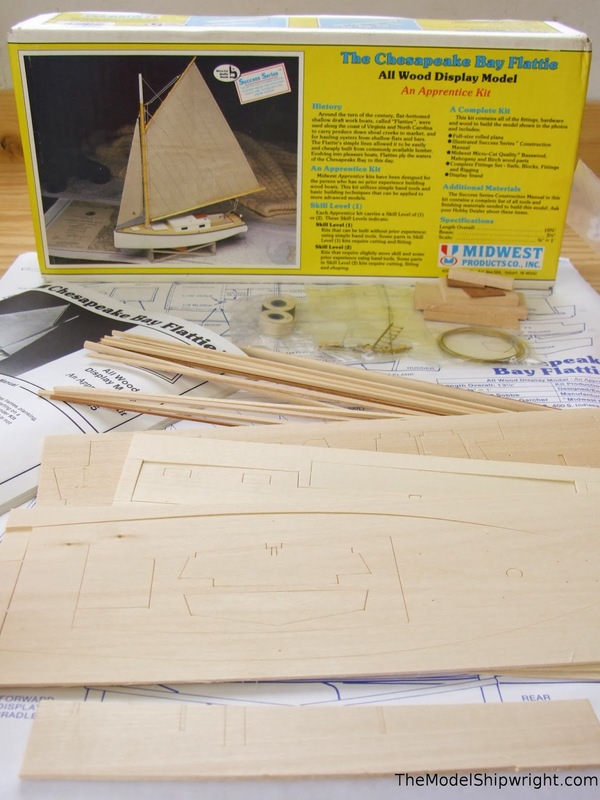 While solid-hull ship models are generally considered the easiest to construct, Midwest Products has created a "Success Series" of ship model kits that offer plank-on-bulkhead models that promise to make model shipbuilding easy for the complete novice. We decided to test this theory by making Midwest's Chesapeake Bay Flattie ship model kit our first on-line kit build. The simple lines of these boats that made them ideal for locals to build from locally-available lumber should also make this an ideal ship model kit or a person with no prior wood ship model building experience. The biggest challenge of plank-on-bulkhead ship models is planking the hull, and because of the simple shape of these boats, this task is accomplished in this kit with a single plank on each of the sides, and two planks on the bottom. The kit comes with well-executed die-cut and pre-cut parts, as well as fittings, rigging line, sail material, and a well-done set of instructions and building plans. We have a lot more steps ahead of us, so keep checking back for updates!